As a Toronto wedding photographer, I had my fair share of fun days and this is one of the best I documented so far. This wedding party is of Italian descent and the obviously know how to party. One of the secrets of wedding photography is to capture the candid moments that reflect the fun of the wedding day. As such, to allow my subjects to get rid of any potential inhibitions, I always suggest that to have the drink or two at the beginning of the wedding day. Usually the bride and bridesmaids have a mimosa while the guys all for something harder. 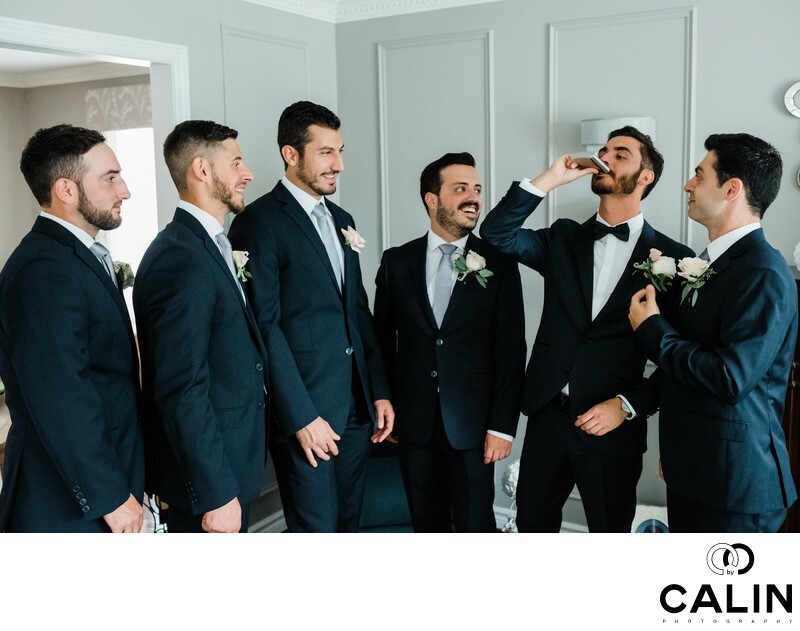 The groomsmen in this photograph chose to share a bit of grappa, a traditional Italian drink made of grapes. Offer two glasses of grappa to any shy groomsmen and he will become talkative and enthusiastic. I have to confess there is a high correlation between the quality of the images taken during the bride and groom preparation and consumption of alcohol. Now don't get me wrong! I do not advocate the bride and groom getting inebriated before the wedding ceremony. However, a drink or two never hurt, release the stress and trigger genuine moments I think capture. After all, in my subjects don't open up in front of my camera, there is much you can do in the photographs posed and boring. I remember I documented a master morning somewhere north of the greater Toronto area and the bride asked all the members of the wedding party and of course the groom to refrain from drinking. Boy, was that the most boring group of people ever. The groomsmen were uncooperative, the groom was on the edge and nobody was having any fun. Now what kind of special day is that if nobody is happy? I know the wedding day is extremely important for brides and I respect that. However, the tension is so high that some brides never enjoy their big day in a quest to ensure everything is perfect for the family and guests. As I mentioned, at this Liberty Grand big day I was lucky to be surrounded by energetic people was a lot of fun, as you can see in this wedding album and the slide show. One of the reasons I love photography is that I am able to capture beautiful moments that the couple will love for the rest of their lives. Unfortunately, Toronto wedding photography is becoming more and more dominated by a few studios that are afraid to innovate. Yes indeed, the world was pioneers but now there photographs look cliché and dated. If you look at two different engagement photo shoots, they look the same. A series of poses captured somewhere in the GTA and which only the couples and the backdrop changes. That rigid approach to wedding photography offers an opportunity for smaller, more nimble photographers. I guess you can say that is the circle of life in photography. The creative wedding photographer starts his new company, grows it from the ground up, hires 10 to 15 artists and becomes complacent. The once creative photography company is becoming a dinosaur afraid of change. Slowly, there was edgy photographs are becoming boring and dated, then annoying and cliché. Suddenly, nobody hires them and they have close shop. Coming back to our image, there are a few elements that make this photograph stand out. First, we noticed a pattern of man dressed in blue suits. As the groom is the only one drinking he breaks the pattern and makes the photograph more pleasing. Next, everybody is looking towards the groom, which makes it once more clear he's the focal point in this photograph. Finally, the figure to ground contrast or the contrast between the groomsmen dressed in navy blue suits and the want backdrop is high and makes the subjects pop. I have to admit this wedding photo will never win an award, but for the couple this accurate documentation of their big day is worth more than the most prestigious photography awards in the world. In fact, I know many professional photographers in the greater Toronto area who shoot to win awards, not to please the newlyweds. Liberty Grand is a spectacular event space located on the shores of Lake Ontario. Location: 25 British Columbia Rd, Toronto, ON M6K 3C3.